I walked out of my house this morning before sunrise. It is garbage pickup day. With the wildlife population explosion we have had I don’t dare take the garbage out too early. When I stepped out on the porch the hot, humid air settled down on my shoulders like a load of bricks. When I made it back into the artificially cooled interior of our home I looked at the weather station on the wall…81° and the humidity was 86%. Now…Do you understand why I dream of the Blue Ridge Mountains? Do you see that heat index at 5:53 in the morning? The middle of August and we still have months of this hot humid weather to go. 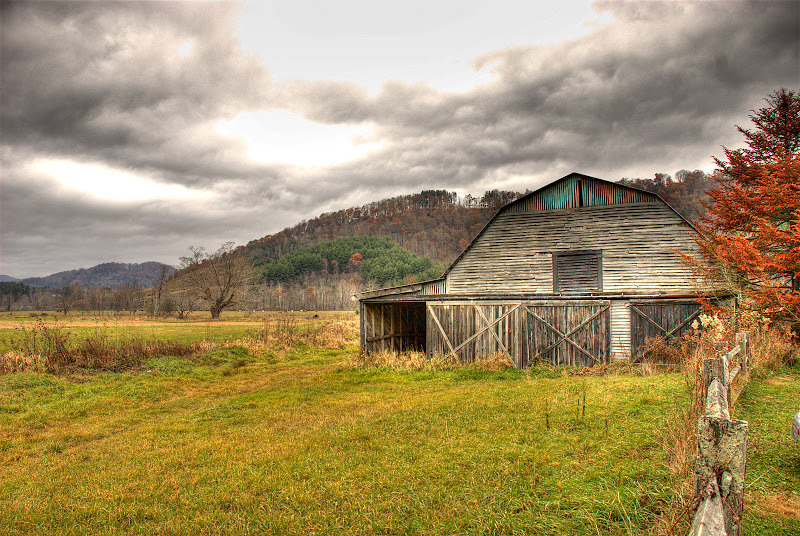 The Barn behind the Mast General Store in Valle Crucis, North Carolina. Taken on November 13, 2007. Processed with Photomatix Pro. Nestled in a secluded mountain valley, you’ll discover spectacular foliage, rustic countryside and a place Charles Kuralt calls, “… a destination.” That place is the Mast General Store in the rural historic district of Valle Crucis. Since 1883, we’ve been outfitting the Appalachians with traditional mercantile goods, comfortable clothing, rugged footwear and quality outdoor gear for all mountain seasons. When in the North Carolina High Country, we invite you to warm up by the potbellied stove, mail a letter at the corner post office, and discover for yourself why….. It would be neat for contributors from all over the country to offer their images to an aggregate gallery called Unplanted Gardens: America’s Roadside Bloomery, I thought. And here it is! All images should include in their composition a road of some kind, just to place it, and then the wildflowers that grow there unplanted. Highway department wildflower beds don’t count. Leaving out of Asheville after sleeping in, always makes that initial climb to the top of the ridges such a long anticipated change in attitude and altitude. Leaving the traffic and the modern speed limits behind and settling into the slower, more natural rhythm of the road as it swings in and out of the clouds, through the laurel thickets, windows down and the moonroof open. The cool air blowing through the car after all those hot humid southern miles across five states comes as a long awaited relief. It’s easy to see why southerners have been spending summers in these mountains for so very long…hoping to escape the long hot summer days and not much cooler nights. So here we are on the Parkway heading north. First stop is always Craggy Gardens Visitor Center. Stretch the legs, enjoy the view, make a potty run. It’s too late to really enjoy the peak bloom in the Gardens. The guide book says there is a short trail leaving from the Visitor Center. We have never taken the time here so close to the beginning of our day to do the almost one mile hike…Maybe next trip. The next stop we generally make up the Parkway is all the way up past Little Switzerland at the Orchard at Altapass. The orchard is one of those places that managed to catch my eye even before we made our first trip. When the Blue Ridge Parkway chose its path, it too followed the ancient buffalo track and came through the middle of the Orchard, dividing it in half. That required a condemnation process, a court fight that eventually reached the NC Supreme Court. The momentum for the Orchard was lost, and it began to decline. Neighbors despaired the loss and braced for the expected development of this beautiful place. The wild growth of the trees became a sadness for Parkway travelers who had seen it in better times. When it was offered for sale in 1994, Kit Trubey bought the land and her brother Bill Carson with his wife Judy started the preservation of the place, including its apples and its memories. The preservation project is underway today, with hayrides, music, story telling, butterfly tagging, free mountain music on weekends, and a store to sell ice cream, fudge, country products, local crafts. The half of the Orchard that lies above the Blue Ridge Parkway has been sold to the Parkway, to assure its perpetual preservation. The remaining land will be protected by conservation easement. The history of the Orchard continues. This is one stop that tend to last a long time as the wife and kids spend time looking through the gift shop. Me…I wander down through the orchard and check out the ancient apple trees. The plans for this years vacation to the mountains would have had us driving from north of Atlanta to Asheville via Cherokee today. We had planned a tour of the Cherokee Village today with lots of stops to photograph the mountains (like these from last year). On last years trip we stopped for the night in Chattanooga, Tennessee before driving into the mountains heading for the home of the Eastern Cherokee. The heat caused us to postpone the our tour of the Village after we did a long wander through the museum. We planned this year to make up for that missed opportunity. Our plans for the night were to stay in Asheville and spend tomorrow at the Biltmore Estate. This is one stop my wife has always wanted to make, she just did not want to drag all of our young ones through the mansion (even though our youngest is 17 this year, it’s not an attraction that appeals to the MySpace crowd). I do not know what it is about huge gilded houses that attract women so…maybe it’s knowing they don’t have to dust and clean the bathrooms. Wondering about the wonders of this remarkable home? Q: Where did the name “Biltmore” come from? A: Vanderbilt created the estate name by combining two words, “Bildt,” for the region in Holland where the Vanderbilt family originated, and “more,” an old English word meaning upland rolling hills. Q: When was Biltmore constructed? A: Ground was broken in 1889, and construction continued through 1895. George Vanderbilt opened Biltmore House to family and friends for the first time on Christmas Eve in 1895. Q: What did it cost to build the house? A: As research continues, we hope to be able to find more receipts and documents which will give us at least an estimate. With a second night in Asheville we planned to be well rested before heading north up the Parkway on Wednesday. It’s been three years now since this picture was taken up on the top of Roan Mountain. We were a bit early for the full bloom but even what we were in time for was impressive. Every time we go back to North Carolina I try to take the time to run up to the AT and the Garden’s. Even an old fart like me can walk a bit of the AT on the Roan. And the views go on and on and on, even when the ceiling is hanging low and the mists are brushing your hair as you walk. Roan Mountain is actually a massif, or mountain mass, with two summits. It is part of a ridge known as the Roan Highlands, and is the highest peak in the Unaka Mountain Range. At its lower elevations, vegetation as southern as subtropical orchids can be found. But at the mountain’s height, vestiges from the ice age remain, including wood sorrel (Oxalis montana), witch hobble (Viburnum alnifolium), and green alder (Alnus crispa), a species usually found in New England. In June, Roan’s open balds burst with the magenta-colored blooms of Catawba rhododendron, which John Fraser designated Rhododendron catawbiense on this mountain during his 1799 expedition. Each plant in the 600-acre spread of natural rhododendron “gardens” might produce as many as 100 flowers. The combination of heath balds, Canadian-zone spruce-fir forests, and, at lower elevations, hardwood coves, supports more than 1,500 species of native plants, flowers, herbs, trees, shrubs, ferns, club mosses, lichens, and mushrooms. Bird scholar Fred W. Behrend named the snow bunting (Plectrophenax nivalis) when he discovered it wintering on the balds. The area is also home to one of southern Appalachia’s greatest concentrations of threatened, endangered, or sensitive plant and wildlife species, with nearly 30 identified, including Gray’s lily, saxifrages, sedges, the saw-whet owl, and the northern flying squirrel. In 1941, 7,000 acres of this naturally significant area were incorporated into the Pisgah National Forest and Cherokee National Forest. We have spent a number of hours walking through the Gardens on the Roan. Considering the actual number of hours we have spent exploring North Carolina, there are just a few places that have monopolized our time more. I look forward to eventually sitting on top of the Roan in the winter with the balds covered in snow…Probably wont happen this year, but soon, my friends, soon I’ll be North Carolina Mountain Dreaming for good. Sherpa Guides are one of my favorite websites when it comes to checking out the natural world of the Appalachians. I spent so much time reading them on-line I finally chased down my own copies through Amazon. Check out the website, they have the full text of the books online. Then go pick up your own copy through the links below…The copies I have were all bought used through Amazon. I saved a few bucks and added some great guides to my bookshelf.